The 2014 edition of Watches&Wonders took place against a tumultuous political backdrop — anyone with an eye on the news that week could not have missed the mass demonstrations of unprecedented scale that filled the streets of central Hong Kong. Fair visitors and exhibitors alike faced daily challenges in reaching the halls of the Hong Kong Convention and Exhibition Centre (HKCEC), and among those who attended Asia’s largest showcase of fine watchmaking were the most ardent members of the horological tribe. They certainly were not disappointed by what the fair had to offer in terms of product novelties and watchmaking debuts. The inaugural edition of Watches&Wonders last year had already set the tone with the premiere of such remarkable timepieces as the Vacheron Constantin Patrimony Contemporaine Ultra-Thin Calibre 1731, the thinnest hand-wound minute repeater in the world at the time. This year, the exhibiting brands all stepped up their game and brought an incredible slew of authentic, innovative high watchmaking to Hong Kong. The star of the 2013 fair, Vacheron Constantin, debuted in 2014 an ultra-complicated watch — the Maître Cabinotier Astronomica — and the highly artisanal Traditionnelle Calibre 2253 L’Empreinte du Dragon. Officine Panerai revived the much-coveted Marina Militare watch in a Radiomir 1940 case, and also floored brand enthusiasts with the reissue of two exceptionally collectible watches from the so-called pre-Vendôme period of the brand. 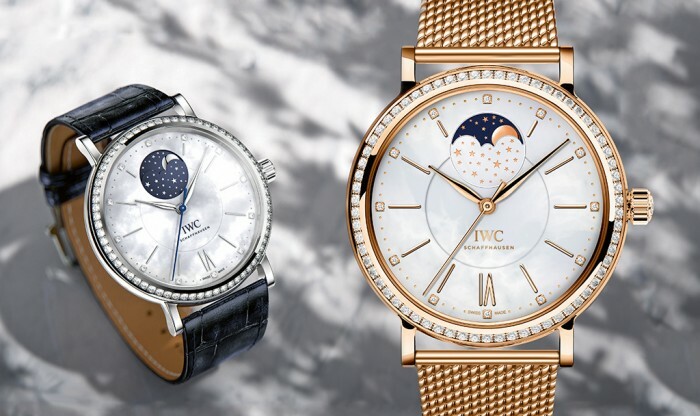 The emphasis on feminine timepieces was also increasingly evident in brands such as IWC, with its resized sub-collection of Portofino watches, and Jaeger-LeCoultre, with its astounding new ladies’ minute repeater. 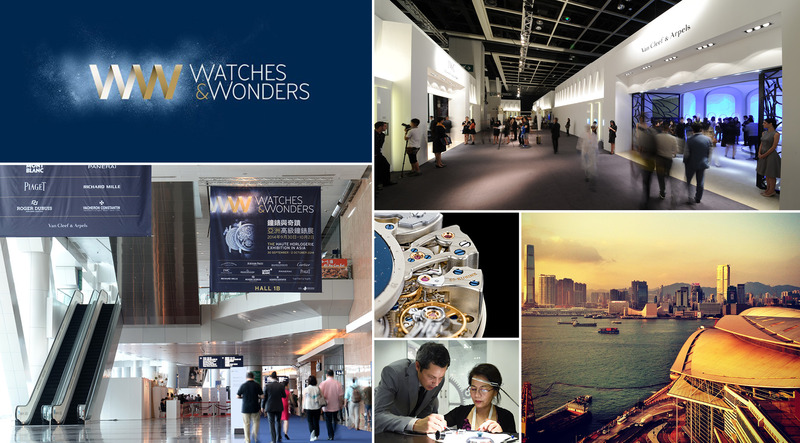 The passion and creativity — the joy that lies in creating new objects of beauty and desire — behind all that was debuted at the 2014 edition of Watches&Wonders was by no means overshadowed by the situation beyond the doors of the HKCEC, but was in a sense almost highlighted by it. It goes to show one thing: that art and passion will continue to perpetuate themselves without reference to politics or economics. And for those of us who love fine timepieces, it is our one duty to watch and to wonder. There aren’t a lot of self-winding A. Lange & Söhne watches, and it’s clear to anyone with half an ounce of aesthetic sense why. Obscuring the view of a Lange movement with an importunate oscillating weight is like putting clothes on Miranda Kerr — why would you do that unless you’re sunk leagues beyond salvation in subterranean chasms of misanthropy? Fortunately for those of us who love beauty in both its horological and Kerrific forms, the analogy breaks down when it comes to the Langematik Perpetual. 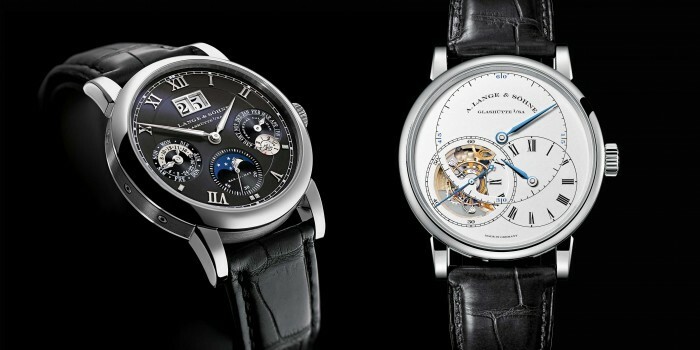 Whilst the vast majority of reactions to a hand-wound Lange movement involve (rather ironically) losing track of time and also control over one’s jaw muscles and salivary glands, the exquisite finish and attention to decoration that characterizes the slender, arching, clean-lined plates and bridges of a manual-winding Lange creation also apply to an automatic Lange movement. Instead of becoming a reviled obstruction to one’s appreciation of a fine watch mechanism, the rotor of the Sax-0-Mat (the “0” is for the zero-reset function, although it’s pronounced “Sax-oh-mat” instead of the clunky yet morphologically accurate “Sax-zero-mat”) becomes itself a repository of artisanal finish. The new version of the Langematik Perpetual combines a white-gold case with an inky black dial, endowing the watch with just the right amount of contemporary stealth whilst maintaining its restrained hauteur. Another watch presented at the 2014 Watches&Wonders fair, the Richard Lange Tourbillon “Pour le Mérite”, reaches up to the very apex of Lange’s exalted technical expertise. The “Pour le Mérite” appellation is only given to watches that feature the headache-inducingly perfect fusée-and-chain system that purports to give a watch greater performance stability through the flattening out of the torque curve emanating from the barrel. At the Asia haute-horlogerie fair this year, the Richard Lange Tourbillon “Pour le Mérite” is presented in white gold, with the innovative pivoting dial segment that allows both legibility and uninterrupted appreciation of the timepiece’s eponymous rotating escapement. The problem with having an enormously successful product in your catalog is that people tend to focus on that and forget how good you are as well at all the other stuff. Audemars Piguet have this problem twice over, because they have both the Royal Oak and the Royal Oak Offshore, commercial juggernauts of stratospheric stature that overshadow the rest of the company’s substantial achievements. The two most recent years at Audemars Piguet have seen a regrouping and reorganization effort within the Le Brassus watchmaker’s repertoire, and as a result we’re starting to see a renewed focus on the manufacture’s in-house technical abilities. The Royal Oak Offshore Selfwinding Tourbillon Chronograph combines the iconic design of the muscular Offshore with the technical aesthetic of forged carbon and black ceramic, powered by the self-winding cal. 2897, as shown through the transparent sapphire-crystal caseback. Despite initial impressions of the movement, the cal. 2897 is actually an automatic movement — as the name of the watch suggests. This may be disorienting on some level, as the rotor is nowhere to be seen. The Royal Oak Offshore Selfwinding Tourbillon Chronograph utilizes a peripheral rotor, a relatively rare beast due to its lower winding efficiency as compared to a centrally mounted rotor. 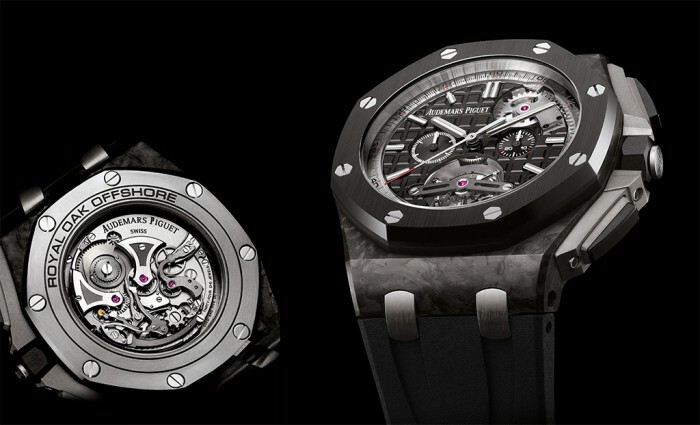 The guaranteed minimum power reserve of 65 hours shows that Audemars Piguet has mastered this elusive system, however. The chronograph works, belying their ultra-modern matte finishes, are actually constructed on extremely traditional principles — reinforcing Audemars Piguet’s commitment to the age-old methods of watchmaking. A column-wheel controlled, laterally coupled chronograph (characterized by its necessity for manual regulation) is at the heart of how the cal. 2897 functions, despite today’s widespread acceptance of vertical-clutch chronographs. The tourbillon, surmounted by a sleek, dark tourbillon bridge, is still extremely classical in its build — the large screwed balance, the delicate overcoil hairspring. The pierced dial allows glimpses of the platinum peripheral winding mass and how its internally geared rotor ring winds the barrel, so that the wearer is always aware of the workings of this superbly engineered beast. There’s an argument to be made that there is no place in today’s market for an affordable hand-wound watch. Watch buyers who prioritize affordability in their timepieces are by and large also looking for a practical buy, and a hand-wound watch is demonstrably much less practical than an automatic watch. The hand-wound watch, we may unequivocally state, belongs to the purview of those who take a romanticized, emotional approach to mechanical watchmaking. The hand-wound watch belongs to someone who appreciates a finely crafted movement, with pleasingly shaped bridges and silkily finished surfaces, who will not grudge the watch its occasional demands for winding and attention. Such a watch is the Baume & Mercier Clifton 8-Day Power Reserve, and its inward and outward presentation is typical of a maison that is as unerring in its aesthetic judgement as it is in its choice of movement. The Clifton collection in general is inspired by a piece from the Baume & Mercier archives, a ’50s watch that epitomized gentility and quiet elegance. Within the Clifton range, there is the regular series, with pebble-smooth profiles and sweeping lines, and there are the emblematic models, which feature stepped lugs and greater depth in their dials and case finishing. The 8-Day Power Reserve belongs to the latter category, and the watch wearer who chooses to lavish attention on a hand-wound movement will also find much to love in the sophisticated design. The price point is higher than that of the other Clifton timepieces, as borne out by the evolved case construction and the high-performing movement — sourced from within the Richemont group of which Baume & Mercier is a part. Making its greater debut at Watches&Wonders 2014 was the Promesse collection of feminine timepieces, which plays with the interactions of circular and elliptical forms to create a quiet, contemporary design. Curves are emphasized, even down to the unobtrusive, rounded lugs that hug the periphery of the case and the hour indices that lie within radial segments of the dial. The focus of this watch is on harmony and modernity, expressed through details such as the faceting of the case and the integration of the lugs within the strap (or bracelet). 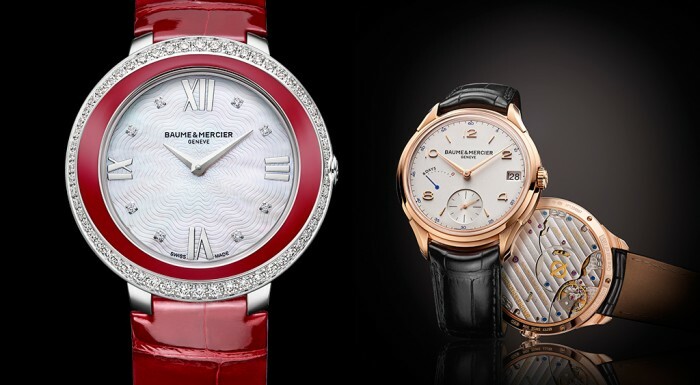 A unique version of the Promesse, which was shown at Watches&Wonders, was a steel model with alternating bezel settings of diamonds and red lacquer. A shimmering mother-of-pearl dial completed the trifecta of textures, with a red alligator-leather strap reinforcing the bright pop of color on the case. Over the last couple of years, Cartier have been slowly but steadily adding to their stable of light complications in order to fill the niche between their entry-level timepieces (which are anchored by their straightforward mechanisms and strict adherence to Cartier’s immense design heritage) and their technically sophisticated fine-watchmaking segment. Watches such as last year’s Santos Dumont with date and power-reserve indication, and the Tortue XL with large date and small seconds are pitch-perfect compositions of Cartier’s mechanical and design expertise. 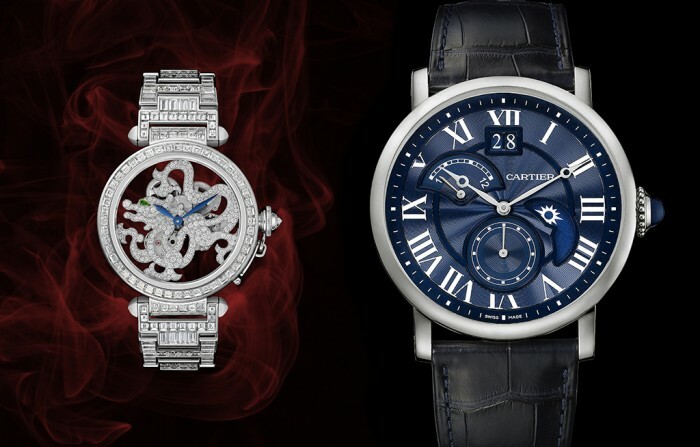 Those who find Cartier’s wide range of flying tourbillons and perpetual calendars a little too intimidating for everyday wear but still want something slightly more cerebral than a simple time-only watch, will instinctively gravitate toward these offerings, which are ideal for the watch connoisseur with restrained tastes. At Watches&Wonders 2014, Cartier has debuted the Rotonde de Cartier Second Time-Zone Day/Night, which packs a surprising amount of information into an eminently wearable 42mm case. As implied by the name, a day/night indicator at four o’clock is coupled to the retrograde second-time-zone display at 10 o’clock. Orienting the dial along the vertical axis are the large date at 12 o’clock and the small-seconds subdial at six o’clock. An automatic movement, the cal. 1904-FU MC, drives the Rotonde de Cartier Second Time-Zone Day/Night, which pays subtle tribute to classic Cartier design with its traditional “pomme” hands and guilloché dial. In Cartier’s second Watches&Wonders debut, the iconic Pasha evokes Chinese mythology through the artisanal technique of watch skeletonizing. The exceptional openworked timepieces of Cartier have captivated watch enthusiasts since 2009 brought us the imposing Santos 100 Skeleton, with its structural and decorative bridges that functioned doubly as hour indices. The 2010 skeletonized gem-set Pasha replicated the emblematic panther of the French maison in glittering diamond-paved bridges. Now in 2014, the stylized dragon that permeates Oriental art forms the movement bridges of the Pasha de Cartier 42mm Skeleton Dragon Motif Watch, available in three versions involving different levels of gem-setting. IWC is engineered for men; the philosophy has anchored the brand and its success for as long as we can remember. Its products are defined by precision, practicality and a certain directness in expression — traits which we associate with masculine personalities. Within the IWC collections, we have the dominant Portuguese family, the patriarchal Da Vinci, the exploratory Aquatimer, the technically astute Ingenieur and the heroic Pilot’s Watch — all of these established archetypes of masculinity that resonate strongly with the brand’s customers. The suave, elegant-living Portofino, which we last saw at the center of IWC’s product focus in 2011, is arguably the most relaxed out of all the IWC collections, so it’s completely appropriate that IWC chose this collection to feature a smaller case diameter and discreet gem-setting. The Portofino Midsize, as this sub-collection is named, includes a moonphase watch, a dual-time with day/night complication and a simple automatic timepiece, all eminently functional wristwear for daily use. There are two sizes in the Portofino Midsize — 40mm and 37mm — and in keeping with the Portofino aesthetic of la dolce vita, the dial and case variations within the collection range from simple brushed faces to mother-of-pearl dials, from slim Roman numeral indices to subtle diamond batons, from plain unadorned cases to diamond-set bezels. It was with the refreshed collection of Portofino watches in 2011 that IWC first introduced the Santoni leather straps, distinguishing the collection with a touch of Italianate craft. These straps continue to feature in the Portofino Midsize, as do the beautiful Milanese mesh bracelets that recall the height of style in the Italian resort towns of the ’60s and ’70s. In context of this placement of the Portofino collection within a certain period of nostalgic glamor, the reduction of case diameter is particularly significant. Watches from that era are markedly smaller than their contemporary equivalents, and a 40mm case would have been considered at the very limits of wearability at the time. The Portofino Midsize realigns the collection with its design inspirations, and although it’s inevitable that these timepieces will find their way onto feminine wrists, that’s certainly not to say that a gentleman inclined toward classically sized watches won’t find these an extremely attractive offering. This has been a rather tremendous year for the Le Sentier watchmaking company. January’s fair brought us the 11th piece in their relentlessly innovative Hybris Mechanica series — the Master Ultra Thin Minute Repeater Flying Tourbillon, whose true mechanical genius has yet to be fully apprehended by the majority of people who’ve encountered it. This startling debut was accompanied by a retinue of glittering timepieces that showcased Jaeger-LeCoultre’s high-watchmaking offerings in highly decorated guise, collectively named the Hybris Artistica. Watches&Wonders did not disappoint when it came to bringing us an equally exciting debut from Jaeger-LeCoultre. The Rendez-Vous collection was first launched in 2012 as the company’s only line dedicated to feminine timepieces. Since then, it has housed a remarkable selection of complications, ranging from the relatively simple (day/night indication) to the visually arresting (tourbillon) to the high-end (perpetual calendar). Given Jaeger-LeCoultre’s existing expertise in chiming watches, which includes innovations in key areas and components such as the chime regulator, gong cross-section, gong-hammer positioning and acoustic transmission, it was only natural for the Rendez-Vous to play host to the queen of complications in its journey through the atlas of Jaeger-LeCoultre savoir-faire. The Rendez-Vous Ivy Minute Repeater is housed in a case of white gold, which is generally considered to be less favourable a material in the transmission of a clear, dulcet chime. The material consideration is entirely circumvented, however, because of Jaeger-LeCoultre’s patent in chiming technology — specifically the crystal gong, which welds the gong to the dial-side sapphire crystal to fully exploit the resonant qualities of monocrystalline aluminum oxide. In deference to delicate manicures, the chiming function of the Rendez-Vous Ivy Minute Repeater is activated via a push-button instead of the more conventional slide, and the new automatic cal. 942A obviates the need for manual winding. 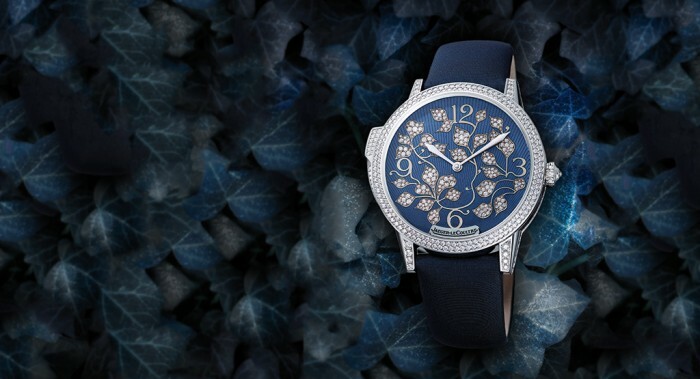 The blue flinqué enamel dial is overlaid with a white-gold and diamond-set design of trailing ivy, which incorporates the hour numerals as well. When we first saw the Rendez-Vous Ivy Minute Repeater in Hong Kong, the one thing that struck us about its chime was its speed, which is quite deliberately slower than that of most other repeaters. After all, a ladies’ minute repeater is rare — only a few companies make them — and the Rendez-Vous Ivy Minute Repeater is for the lady who understands that the only luxury that is rarer than a feminine minute repeater is the luxury of being able to take one’s time. Depending on how you look at things, there is either nothing new about the Montblanc Metamorphosis II, or it perfectly encapsulates the changes we see going on at Montblanc. In the camp of the former argument, we have the technical specifications of the watch and movement, which are identical to the previous Metamorphosis that we first saw in 2010. Activate the slide on the left of the watch, and the date and hour subdials fan open to reveal underlying secondary dials. The lower secondary subdial — which enacts a dramatic rise toward the dial crystal, asserting its prominence in the metamorphosed aspect of the watch — marks off the elapsed chronograph minutes with the aid of an arrow at the subdial’s 12 o’clock position. The upper secondary subdial still displays the hours, as it did before the metamorphosis, but its markers are now simple Arabic numerals instead of the expansive, pre-metamorphosis Roman numerals, signifying the relatively quieter status of the time-telling function in the watch now that the chronograph function has been activated. So far so 2010. What the Metamorphosis II represents, however, is the translation of existing Montblanc expertise into accessible and appealing design vernacular, a direction that also finds expression in the introduction of the new Heritage Meisterstück and Bohème collections. (These two collections in particular take the accessibility of Montblanc watches beyond mere aesthetics and into the incredibly consequential area of pricing.) The Metamorphosis II no longer wears the rather unwieldy egg-shaped case of its predecessor, shedding this embryonic form in favor of a smoother silhouette. The elements of its dials are entirely classical, balancing the aggressively innovative technicality of the movement. The black and red color scheme suited the first Metamorphosis, accentuating the progressive approach of the timepiece. It gives way, in the Metamorphosis II, to a dichromatic maturity and confidence that allow the mechanics to speak for themselves. There is one thing that Officine Panerai is absolutely unsurpassed at doing, and that is resurrecting the celebrated icons of its watchmaking history (as admittedly brief as that history is) and translating them into contemporary timepieces with just the right amount of acknowledgement to the past. Watches&Wonders 2014 brought us a crop of truly fascinating Panerai novelties, and one key piece that stood out was the limited-edition Radiomir 1940 Marina Militare 3 Days Acciaio 47mm, designated as the PAM00587. Some of the most collectible (and costly) vintage military timepieces are WWII-era Panerai timepieces — the Marina Militare models that were worn by Italian Navy divers. In creating this homage to one of their most sought-after vintage pieces, Panerai is offering 1,000 buyers the opportunity to own a coveted military-style watch with an in-house movement (the cal. P.3000), thus uniting mechanical legitimacy with design authenticity. Another category of watches for which Panerai enthusiasts will happily pledge their firstborn children are the so-called pre-Vendôme Panerai watches. These are watches that were produced after 1993 (the first production of non-military Panerai watches) but before the acquisition of Panerai by the Vendôme group (later fully incorporated into Richemont), and include the Slytech models associated with action megastar Sylvester Stallone. This year at Watches&Wonders, Panerai has released a reissue of two such models: the Luminor Daylight and the legendary Luminor Black Seal, originally created for Stallone during his involvement in the film Daylight. The two timepieces are available only as a single set, designated the PAM000785 and replicate their inspirations almost completely, with the crucial difference being that these new models lack the “Slytech” nomenclature on the dial and feature Panerai’s in-house P.5000 movement with eight days of power reserve. In another nod to the pre-Vendôme models, each of the 500 units of the PAM000785 comes in an exclusive pear-wood presentation box, which comes with extra straps, a model of the SLC (Siluro a Lenta Corsa) human torpedo and literature about the military equipment of the Royal Italian Navy Special Forces (which naturally includes instruments that were commissioned from and made by Panerai). There are essentially two types of skeletonized movements that you see in watchmaking. Both are entirely concentrated on removing material from watch movements, but the point at which this approach drastically bifurcates is in the realm of aesthetics. On the one hand, you have the extremely elaborate, baroque freeform curlicues and spirals of engraved metal that coalesce in a physics-defying web of wheels and gears. On the other hand, the modern approach invokes the industrial aesthetic of geometric angularity, symmetry and grid-like scaffolding. 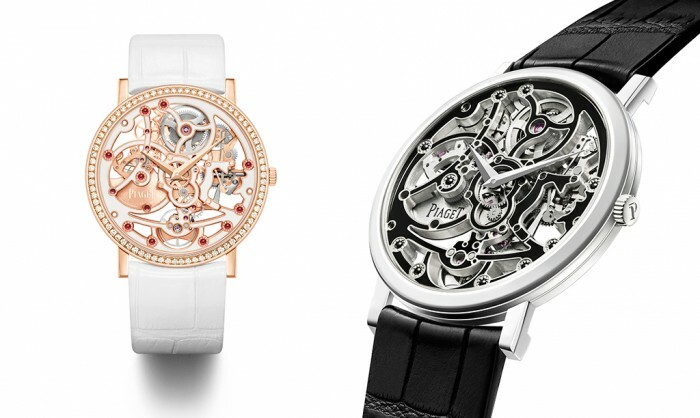 The technique that is used by Piaget in its skeletonized watches occupies the unique space between these two extremes and is completely in line with the maison’s modern-classic aesthetic outlook. Whilst the lines of the cal. 1200S skeletonized movement (introduced in 2012) followed the graceful swoop and curve of the traditional methods, its plates and bridges eschewed the overwrought engraving associated with that style, integrating instead some of the solidness and the matte surface finishing that characterize contemporary openworked watches. The cal. 1200S is slightly thicker than its foundational movement, the cal. 1200P, but that’s partly due to the fact that the cal. 1200S is an ultra-thin movement. Bridges that have been carved into bulimic slimness are usually a little more generous in the height department to compensate for this material deficiency — essential rigidity must be maintained to prevent catastrophic failure of the movement’s mechanical integrity. Piaget’s cal. 1200S is far more technically accomplished than is commonly assumed, but that is perhaps its own fault for being so distractingly good-looking. The 2014 edition of Watches&Wonders revisits the cal. 1200P, but this time in dichromatic formalwear. The surface of the mainplate has been carefully hollowed out to form shallow troughs for the containment of vitreous enamel, in a technique known as champlevé. The gold mainplates have been decorated with black or white enamel, which adds an extra layer of complexity to the movement — complexities associated with the delicacy of working with vitreous enamel and the extremely high levels of artisanal savoir-faire needed to successfully execute this technique. Decorative enamel is usually applied to dials and cases — to apply it to a movement is virtually unheard of, and the cal. 1200E (“E” for “enamel”) is assuredly the world’s only enameled ultra-thin skeletonized movement. More people should know this, because it’s pretty incredible. Also, it looks stunning. Confesssion that is not so much a confession as it is an outright statement of admiration: I think Richard Mille watches are transcendental. What, you may wish to inquire at this juncture, do they transcend? But a better question to ask might be: what do they not transcend? 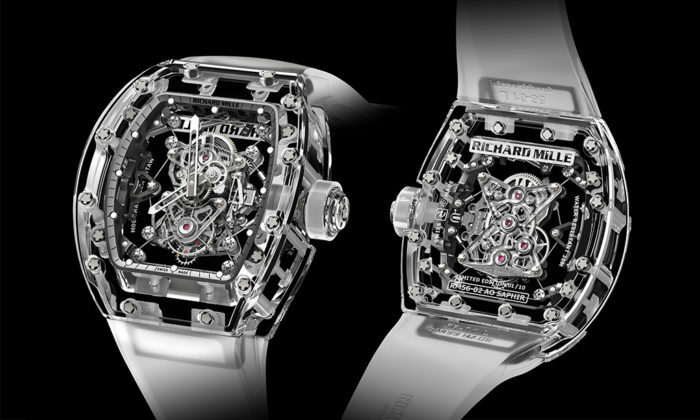 Richard Mille watches routinely alter the way we fundamentally think about watches as lifestyle and luxury objects. It is the only watch brand whose creations — ultra-technical and dazzlingly bejeweled alike — can be worn without consideration to gender. Richard Mille watches made it acceptable for us to talk about carbon nanotubes and polymer resin in the same sentence as a six-figure watch. Because of Richard Mille, luxury lost its weight and became as swift, light and forceful as the forehand stroke of a tennis ace. And because of Richard Mille, watches became transparent. The first watch to feature a sapphire-crystal case was the RM 056 in 2012, a split-seconds chronograph and tourbillon that looked as alien and beautiful as a crystalline, pulsating jellyfish. Since then, the brand has released the 2013 RM 56-01 Tourbillon Sapphire, which had much greater transparency compared to its predecessor — the tourbillon, as compared to the chronograph, has far fewer components and is a more compact mechanism. When combined with a sapphire-crystal baseplate and bridges, the RM 56-01 Tourbillon Sapphire was an arresting, cinematic step up from the RM 056. The RM 56-02 that was shown at Watches&Wonders 2014, therefore, was unsurprisingly another evolutionary level ahead of the RM 56-01. Gone is the sapphire-crystal baseplate, replaced by a light titanium frame of much smaller proportions. The movement has been reduced to its most economical dimensions, but hovers in the cavity of the sapphire-crystal case with the aid of the suspension cables that we first encountered in the Tourbillon RM 27-01 Rafael Nadal. The perfectly calibrated cable is held in place by a tension screw visible at the nine o’clock position, and the precision needed to position the movement in its case is reminiscent of the genre-smashing RM 012 Tourbillon that famously held a three-dimensional, clustered movement that defied every assumption we have about movement construction. In a very literal sense, the RM 56-02 is the perfect timepiece to launch at the Asian exhibition of haute horlogerie — it is a watch, and it is a wonder. We first saw the Hommage collection making its presence felt again in the Roger Dubuis catalog at the end of 2012, when Mr. Roger Dubuis made his long-awaited return to the brand that bears his name. 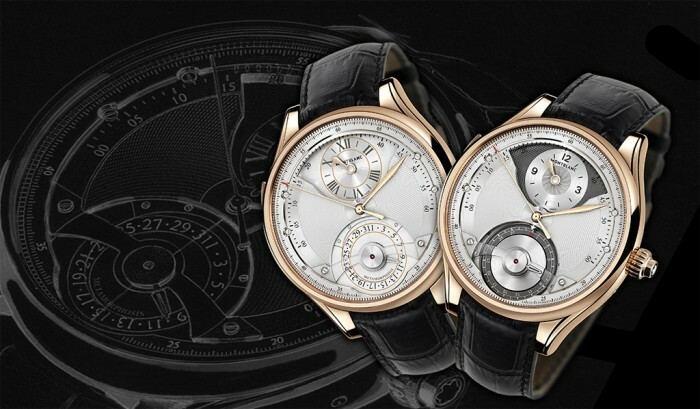 The Hommage collection was one that had long been dear to the heart of Mr. Dubuis, so it was not too much of a surprise to see a minute repeater and flying tourbillon in the case of an Hommage watch appear at the 2013 Salon International de la Haute Horlogerie (SIHH) alongside the rest of the brand’s Excalibur-focused novelties. 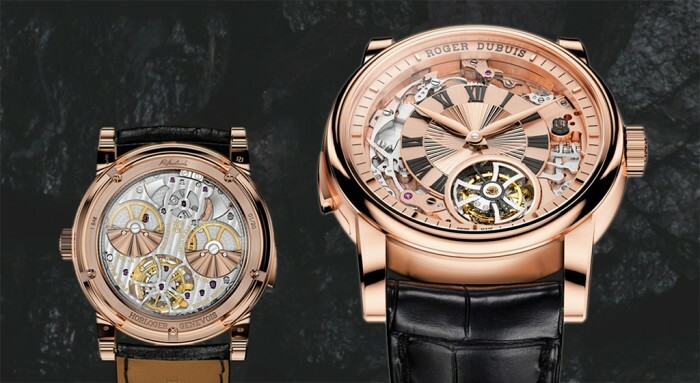 This year has been a full-fledged Hommage year for Roger Dubuis, with the collection incorporating some of the brand’s most exalted movements, including the double flying tourbillon (which has become somewhat of a signature for the maison) and the in-house chronograph movement cal. RD680 that we first saw in the 2010 La Monégasque collection. The minute repeater and flying tourbillon make a second appearance in the Hommage collection this year at Watches&Wonders. Distinct from its first outing in pink gold with a transparent sapphire-crystal dial, the 2014 Hommage Minute Repeater Tourbillon Automatic has a guilloché inner dial of pink gold that displays the hours and minutes, and an outer rim of exposed movement that allows the wearer to observe the interaction of the minute-repeater works — specifically the levers and racks, which drive the striking hammers. Each watch in the Hommage collection is signed with Mr. Dubuis’s signature on the caseback, to indicate the close ties between this collection and the man whose expertise launched the brand. Although it is relatively rare to find self-winding minute repeaters — the presence of a rotor necessitating a small space between movement and caseback, which may be considered detrimental to sound propagation — the cal. RD104, which powers the Hommage Minute Repeater Tourbillon Automatic, incorporates a recessed micro-rotor of platinum to ensure constant winding of the watch. Particularly in a tourbillon watch, this continuous winding during uninterrupted wear is an advantage. The minute repeater, as in all other examples of this complication, is run off a separate barrel that is wound by actuating the repeater slide. The watch is limited to an edition of 20 pieces. I was once told — by someone with considerable expertise in this area — that the arithmetic progression in number of complications within a watch translates to a geometric progression in terms of associated complexity. In other words, increasing the number of complications in a watch creates a much higher increase in the level of difficulty. So a watch that is twice as complicated isn’t just twice as difficult to make — far from it. With that piece of information, try and imagine the process of creating the Maître Cabinotier Astronomica, a horological opus that unites 15 high-watchmaking complications in a single timepiece. The list of functions contained within this watch reads like some kind of watchmaking master curriculum: minute repeater, tourbillon, perpetual calendar, power-reserve display, equation of time, sunrise and sunset times, moonphase indication, sidereal time, indications of the seasons, sky chart with zodiac progression. One would think there wasn’t enough space on a wall clock — let alone a wristwatch! — for all that information. The double-dial format of the Astronomica, however, allows every single detail to be depicted with significant legibility. The minute repeaters of Vacheron Constantin have a reputation for being some of the best-sounding sonnerie watches available; the cal. 2755, in particular, is well known for its exceptionally fine tones. With such mastery of chiming complications, it ought to be of no concern at all that Vacheron Constantin has chosen to house the Astronomica in a case of white gold, which is conventionally understood to impart harshness to the chime. (The platinum-cased cal. 2755 sounded divine despite the unfavorable acoustic properties of platinum.) What with last year’s Patrimony Contemporaine Ultra-Thin Calibre 1731 Minute Repeater also being presented in Hong Kong, Watches&Wonders is quickly becoming known for its show-stopping debuts from Vacheron Constantin. Maintaining the focus on métiers d’art that Vacheron Constantin has placed on its recent novelties is the Traditionnelle Calibre 2253 L’Empreinte du Dragon, with a case that is engraved entirely by hand to resemble a skin of overlapping golden dragon scales. Despite its scintillating exterior, the L’Empreinte du Dragon is no slouch in the technical department — as is only to be expected with a Vacheron Constantin watch — it contains a tourbillon, perpetual calendar, equation of time, sunrise and sunset times, and power-reserve indication, on top of the hours, minutes and small seconds. The curious thing about the universe around us is how natural meteorological phenomena can be observed, recorded, calculated and (to a certain extent) predicted, and yet still be so deeply unfathomable. The astronomer who plots and charts the journeys undertaken by celestial giants across the skies will be able to pinpoint with eye-watering precision the next period of Mars in retrograde, but he will not be able to instruct you on the significance of this divine choreography any more than a coelacanth would. This paradigm translates over to horological contexts to a great extent — very few things are as simultaneously scientific and wondrous as the art of watchmaking. Van Cleef & Arpels has made something of a theme this year based on this parallel, bringing together the worlds of watchmaking and astronomy. At the beginning of the year, the Van Cleef & Arpels Midnight Planétarium condensed the workings of our solar system into a wristwatch with the collaboration of Dutch specialist in astronomical horology, Christiaan van der Klaauw. 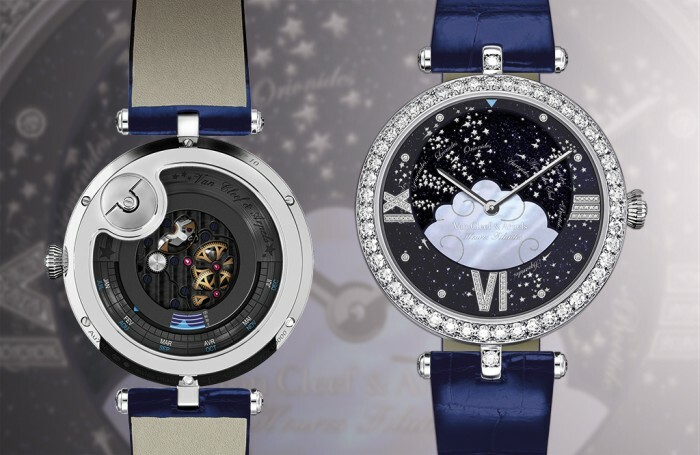 Astrology-themed watches with decorated dials also followed in the same skyward vein, with constellations depicted on the dials of Midnight timepieces and creatures of the Occidental zodiac executed in gems, semi-precious stones and enamel on the dials of Lady Arpels timepieces. At Watches&Wonders 2014, Van Cleef & Arpels presented the Lady Arpels Heures Filantes Poetic Complication, portraying the episodic cosmic conflagration that we know as meteor showers, or shooting stars. When comets blaze through our skies, particles shed by their exposure to the sun crash into the Earth’s atmosphere and flare up, causing rapid darts and shards of light known as meteors. Meteor showers happen at regular intervals, and our knowledge of comet paths and their cycles allows us to predict when they happen with a great amount of detail. The Lady Arpels Heures Filantes Poetic Complication shows the major meteor showers within the year on a rotating disc seen through a dial aperture — the Leonids, Orionids, Geminids, Aurigids and so on. Furthermore, in keeping with Van Cleef & Arpels’s continuous affinities between mechanical watches and our emotional inner lives, the Lady Arpels Heures Filantes Poetic Complication incorporates a wish-making calendar. Drawing on the tradition of making a wish on shooting stars, the rear display of the Lady Arpels Heures Filantes Poetic Complication allows you to monitor the number of shooting stars per hour during meteor season, so you can time your wishes to catch the most shooting stars.